Detailed map of the situation in Donbas region. 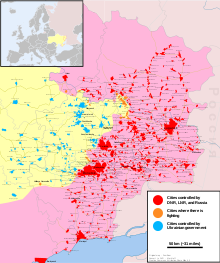 Red is under Russian control, yellow - under Ukrainian. Of course, foreigners are most interested if the situation in Ukraine is safe enough. Well, it's necessary to mention that the war takes place in the extreme South-East while Kyiv is situated in Northern Ukraine. The distance form Kyiv to the closest frontline is about 700 (yes, it's not mistake, seven hundred) kilometers: it is actually closer to Russia-Kazakhstan border (600 km) than to Kyiv. All neighboring to Kyiv regions are calm, with no military activity. So, from the maps you can see on the right, we can summarize that Kyiv is safe enough city, situated far away (more than 700 km) from the dangerous area. The crime rate is not higher than average in Europe. What are the emergency numbers for police and ambulance? General emergency number is 112; Fire - 101, Police - 102, Ambulance - 103. What languages are commonly spoken? The official language is Ukrainian, Russian is understandable, Belorussian, Polish & Slovakian are partially understandable. Basic knowledge of English (younger generation), French / German are relatively frequent, but in most cases are limited. Does Ukraine have freedom of panorama? Can I safely take pictures of official buildings, trains and planes? Unfortunately, Ukraine doesn't have freedom of panorama yet, and you're limited to publishing pictures of public domain monuments and buildings only (or of ones with OTRS permission). But you can take and publish pictures of trains and plains. Does the venue have Wi-Fi? Does the hotel have free Wi-Fi? How easily can I find Wi-Fi in cafes, bars, etc? In big cities very easily. Almost every café and bar has Wi-Fi. Where can I find the materials & photos? See the category on Commons. This page was last edited on 20 March 2015, at 10:42.